The great Himalaya to Everest from Jiri Everest Base Camp Trekking which routes was taken from Sir Edmond Hillary, Adventure Pilgrims trekking offers for you The Everest or the Khumbu region is justifiably the most famous of all the trekking and mountain regions. Populated by the Sherpas, the attractions of this area are the majestic mountains, the high mountain villages, charming monasteries and the congenial people. This area includes the highest mountain in the world, Mount Everest (8,848 m.) and many peaks of altitude 8000m. and above, such as Lhotse, Cho Oyu and Makalu. This section is less crowded as most people fly to Lukla and walk only the high-altitude portion of the route. The trek from Jiri involves a tremendous amount of up-and-down walking. The trek climbs to the ridge that separates two rivers, descends to the river itself, and then ascends the next ridge. Even though the trek begins at an elevation of 1860m, on the sixth day it crosses the Dudh Kosi at only 1500 m after considerable uphill and downhill walking. Everest Trek is not only famous for its proximity to the world’s highest mountain,but also for its friendly Sherpa people, picturesque villages, great variety of cultures and traditions, colorful festivals and ancient monasteries. The flora and fauna are other ornaments of the Sagarmatha National Park and the story of the yeti is still a mystery of the world from the Khumbu region. Day 1 : Drive from Kathmandu (1350m.) to Jiri (1905) takes about nine hours. Stay overnight at lodge. Day 2 : Trek from Jiri (1905m.) to Deurali (2705m.) takes about five and half hours. The beginning of your trek gently ascends for the first two hours to Mali Danda (2440m.) and then it descends to Shivalaya (1800m.). The trail then steeply goes up for two hours and for the rest of the day goes gently up to Deurali. Stay overnight at lodge. Day 3 : Trek from Deurali (2705m.) to Sete (2400m.) takes about six hours. The start of your trek is a steep descent for an hour to Bhandar (2250m.) and then gently descends to Kenja (1600m.) Stay overnight at lodge. Day 4 : Trek from Sete (2400m.) to Junbesi (2675m.) 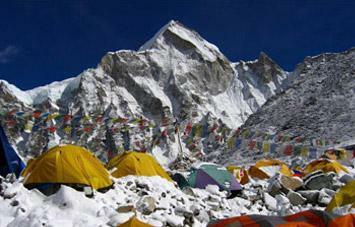 takes about six hours.You climb steeply for early two hours passing through Dagchu, Goyem, small Sherpa settlements. Then, cross over the Lamjura Pass (3500m.) through rhododendron forest. Stay overnight at lodge. Day 5 : Rest day at Junbesi to hang around or visit Thubten Chholing. Stay overnight at lodge. Day 6 : Trek from Junbesi (2675m.) to Nunthala (2200m.) takes approximately six hours. 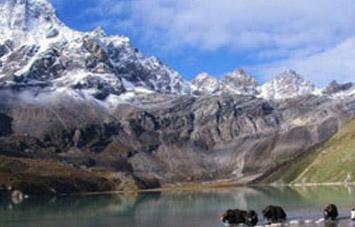 The beginning of your trek gently ascends for early one and half hours to Phurtung (2900m.). It then levels out to a gentle descent to Ringmo Khola (2500m.). Immediately, your trail ascends steeply up for one and half hours to the Takshindo La Pass (3100m.). Stay overnight at lodge. Day 7 : Trek from Nunthala (2200m.) to Bupsa (2350m.) takes about six hours. The beginning of your trek gently descends to the Dudh Koshi river for the early two hours passing through agricultural farm land and small Sherpa and Rai settlements. From the Dudh Koshi river, your trail goes up all the way to Kharikhola (2050m.) passing through Juving (1680m.) a big Rai village and farm lands. Stay overnight at lodge. Day 8 : Trek from Bupsa (2350m.) to Surkey (2400m.) takes about five and half hours. At the beginning of the day, you ascend steeply for early two hours to Khari La Pass (2880m.). During this time you pass through rhododendron and oak forests including a small Sherpa settlement and tea shops. At the end of the day, your trail steeply descends to the destination. Surkey is a small Sherpa village at the bottom of the Lukla. Stay overnight at lodge. Day 9 : Trek from Surkey (2400m.) to Phakding (2652m.) takes about five hours. The first part of the trek gently ascends for early 2 hours to Chhiplung (2700m. ), a junction road to Jiri and Lukla, passing through Mushe (2650m.). Your trail is then almost flat until gently descending and ascending to Phakding. Stay overnight at lodge. Day 10 : Trek from Phakding to Namche Bazaar (3440 m.) takes about five hours. This day you trek and cross the river on high suspension bridges. Beyond Monjo (2800m.) is the entrance to the Sagarmatha National Park. You then ascend quite steeply to Namche Bazaar. Namche Bazaar is the main trading village in the Khumbu region and holds a busy Saturday market. Stay overnight at lodge. Day 11 : Rest at Namche Bazaar for acclimatization and excursion around the places. Rest day not for sleep you will be visiting high places and villages with our guides, Namche is tucked away between two ridges amidst the giant peaks of the Khumbu. For acclimatization, you walk up to Khunde Hospital, or you may take a one hour walk up to the Syangboche (3800m.) where Everest View Hotel is situated above Namche Bazaar. Stay overnight at lodge. Day 12 : Trek from Namche Bazaar to Tyangboche (3850 m.) takes almost five hours. From Namche, the trail contours around the side of the valley, high above the Dudh Koshi. Passing by several villages and numerous tea shops, the trail descends steeply to a bridge over the river Dudh Koshi at Phunki Tenga (3250m.). Tyangboche is famous for its legendary monastery, the largest in the Khumbu region. Stay overnight at lodge. Day 13 : Trek from Tyangboche to Dingboche (4350m.) takes about five and half hours. You gradually descend through a forest, cross the Imja Khola and climb steadily up to the village of Pangboche. A further two and half hour’s walk brings you to Dingboche. Stay overnight at lodge. Day 14 : Rest at Dingboche for acclimatization and excursion in and around the places. Here, you can steeply climb up to Nakartsang Gompa. The another option provided is a small side trip to Chhukung which takes about two and half hours to go up and one and half hour to come back to Dingboche. Stay overnight at lodge. Day 15 : Trek from Dingboche to Lobuche (4930 m.) takes about six hours. The onward journey leads north for up to 50 minutes until you come to a Mani-prayer Stupa. After two hours walking, the trail from Pheriche joins near Dugla (4595m) before a small wooden bridge over the river of Khumbu glacier. After a short break, continue trekking up to Lobuche, hidden and sheltered from the wind. Stay overnight at lodge. Day 16 : Trek from Lobuche (4900m.) to Everest Base Camp via Gorakshep (5180m.) and back to Gorakshep takes about six hours. 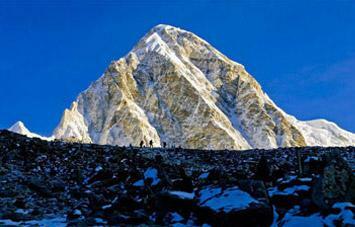 You will spend about 4 and half hours trekking up to Everest Base Camp and back to Gorakshep. The trek is on a glacier and snow- capped rocks. You can also see many small frozen lakes around the Everest Base Camp. You then return to Gorakshep. Stay overnight at lodge. Day 17 : Trek from Gorakshep to Kala Patthar (5545m.) and back to Pheriche (4250m.) takes about six hours. Early morning climb to Kala Patthar (5545m.) and enjoy the view of sunrise. Stay overnight at lodge in Pheriche. Day 18 : Trek from Pheriche to Tyangboche (3867 m.) takes approximately four hours. You can have a morning visit to the research center. Then, trek back to Tyangboche, an easier descent passing through rhododendron forest. Stay overnight at lodge. Day 19 : Trek from Tyangboche to Namche Bazaar (3440 m) takes about four and half hours. The walk from Tyangboche is mostly downhill on the main trail with a few steep climbs for an hour from the bridge at Phungitenga, near Shanasha. From Khumjung village another 30 minute walk brings you to the village of Khunde. After Khunde, a scenic and pleasant walk brings you to Namche for your overnight stay. Stay overnight at lodge. Day 20 : Trek from Namche Bazaar to Lukla (2886 m.) takes about six hours. The last day of your trek leads from Namche Bazaar via Monjo to Lukla. The trek is pleasant, except for few short uphill climbs and then down to the Bhote Koshi River crossing it three times. Stay overnight at lodge. Day 21 : Fly from Lukla to Kathmandu takes about 35 minutes. You can either relax the whole day or you may be willing to buy some gifts and present to your family and friends. 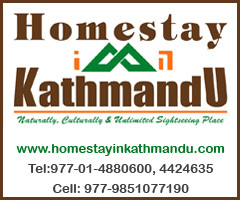 Guide will assist you if required.or you can join us to our other activities like White Water River Rafting, Jungle Safari, Annapurna Region Trekking, Nepal Tour and many more. Note: Please make some extra days so you will see Kathmandu and also if flight cancellation in Lukla so you do not need to hurry and worry write us your feedback.